Acer is highlighting two distinctive laptop designs to address the separate need and expectation of consumer and commercial laptop PC users, at Computex Taipei 2007. Visitors will also find on display Acer’s full range of products from the desktop, server, LCD TV, LCD monitor, and projector lines, with new products from the laptop and desktop PCs making their first appearances at the show. 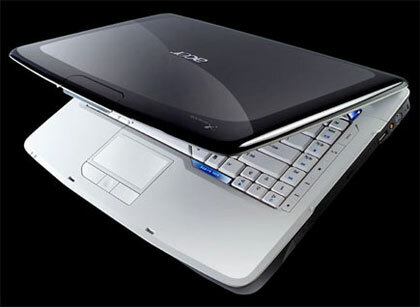 Acer is tailoring its notebook design and functionality for consumer and commercial market needs. The brand characteristics for the Aspire are easy and fun, and dependability for the TravelMate mobile user. Aspire Gemstone design: The Gemstone concept laptop features a shiny jet-black frame encasing a satin-finish sub-layer with the Acer logo floating above like a shimmering holographic-3D projection, this unique feature is achieved through advanced in-mold design technique. Open the cover to reveal a light gray ceramic-like interior surface for a striking contrast against the black exterior. The entire laptop is smoothly curved like a finely-cut opal and provides a very comfortable touch. An enlightener media flow frames the keyboard and joins the speaker grill, Empowering Key, and touch-sensitive Acer MediaTouch keys, expressing the Aspire’s individuality.